If there was no Edgar Bergen, there would be no Charlie McCarthy. Edgar Bergen was born Edgar Berggren, to Swedish immigrant parents in Chicago, IL though the family moved to Decatur, MI. At 11-years-old, he taught himself how to throw his voice from a pamphlet. He practiced throwing his voice by playing tricks on people. Sometime before his 16th birthday, he commissioned Theodore Mack to create Charlie McCarthy's head while he created his body. While back in Chicago attending Lakeview High School and working in a silent movie theatre, Bergen gave his first ventriloquist performance at Waveland Avenue Congregational Church. 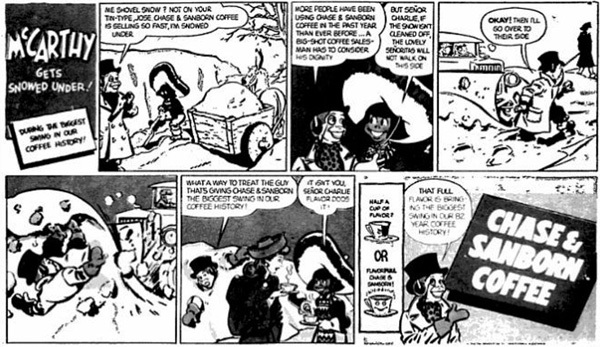 After school, Bergen moved on to performing in vaudeville and short movies (called shorts) plus he legally changed his name from Berggren to Bergen. While playing at the Rainbow Room on the recommendation of Noel Coward, producers saw his act with Charlie and recommended them for a guest appearance on Rudee Vallee's radio show. Bergen and Charlie were such a hit, they were offered their own show. In 1937, The Chase and Sanborn Show opened with Edgar Bergen and Charlie McCarthy starring. Nelson Eddy was the show's regular singer with frequent time off for making movies. When Eddy was off making movies, various singers would fill in. Don Ameche was the Master of Ceremonies and acted in different bits on the show. Dorothy Lamour was a regular and W. C. Fields appeared on the first 18 shows. Interestingly, Fields had a feud going with Charlie. 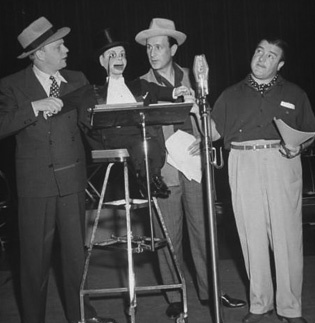 In addition to Charlie, Bergen premiered another dummy on the show called Mortimer Snerd. Mortimer was a dummy in every sense of the word. Mortimer was slow-witted and came off as a bit of a hick. Finally, there was also man-crazy Effie Klinker, another dummy that appeared on the show. Bergen was on the radio from 1937 to 1956 going through different sponsors and different titles for the show. One title for the show was the Charlie McCarthy Show where the dummy had top billing. Later Bergen had top billing in The New Edgar Bergen Show. Outside of the radio show, Bergen and McCarthy appeared in movies together, sometimes with top billing such as The Goldwyn Follies, You Can't Cheat an Honest Man, and several others. Bergen also appeared in several films without his regular companion. Those films include I Remember Mama and Don't Make Waves plus he appeared as the original Grandpa Walton in the television movie. 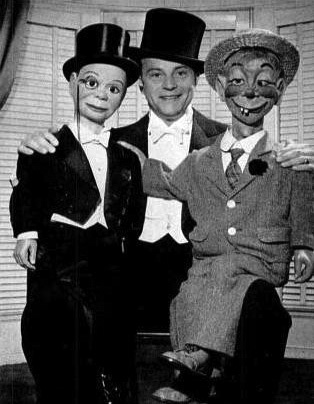 After radio, Bergen made numerous guest appearances on television shows, even playing Charlie McCarthy on one show. He also continued to make movies and appear live on stage with his act. His final movie was The Muppet Movie in 1977. He died shortly after finishing the movie in 1978 and it is dedicated to him. As for his family life, Bergen married Frances Westerman when he was 39 and she was 19. She was in the audience for his radio show in 1941 and he noticed her legs. From there they started a long courtship, eventually marrying in 1945. They had two children, Candice Bergen, an actress, and Kris, a film and television editor. Candice and Frances both made appearances on the radio show and Candice appeared with her father on television. Kris was born well after Bergen's radio show was off the air. He and Frances were together until his death.